Bridge: Bolivian Jacaranda and bone frets. Tuning: typically tuned GCEAE. all ten strings are tuned inside one octave. The five pairs of courses or strings are pitched as follows (from 5th to 1st course): gg cc eE aa ee. ) 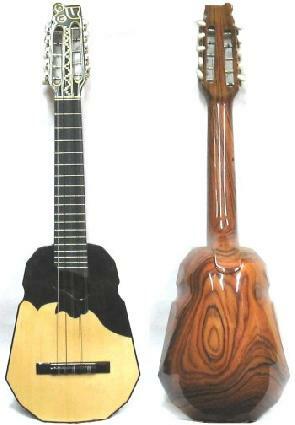 It usually has 5 charango strings and 5 guitar strings. Width: 25 cm. (9. 84"). The ronroco is a larger relative of the charango, in Bolivia, a ronroco is an octave down from a charango, with its distinctive shape and sound is a traditional Andean stringed instrument of the lute family. Developed in Bolivia by Gonzalo Hermosa a member of the famous Group Kjarkas is well known within the musicians and string Instruments lovers.